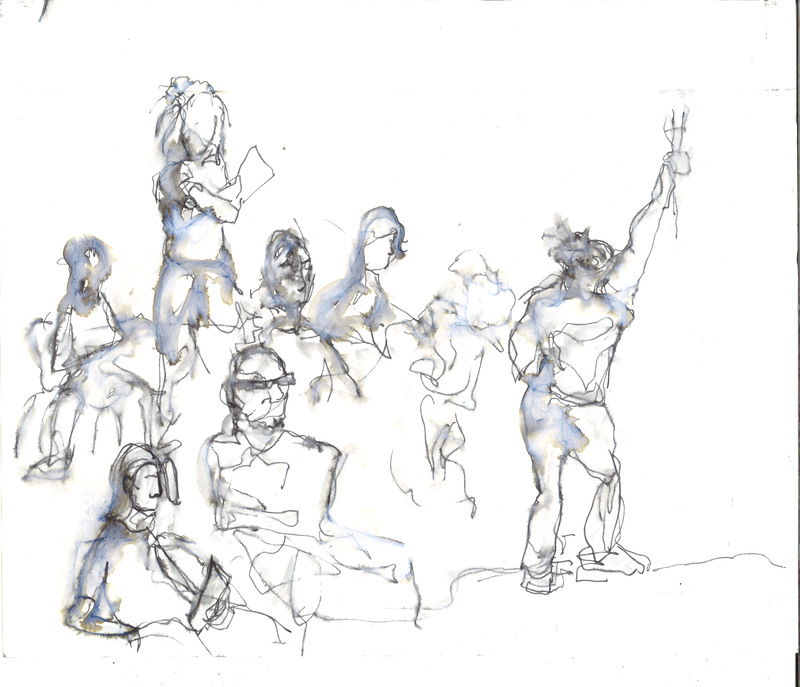 The following text is a journal from two sessions as a sketch artist observing the rehearsal of the London Shakespeare Workout programme directed by Dr. Bruce Wall, where I aim to capture some of the live performers as they practice their craft in a most unexpected venue in London. Article originally published on kelise soixante-douze (kelise72.com) – “Life drawing lessons with London Shakespeare Workout in their 20th year – London” – 18 December 2018. Here, I have updated the post with new images. If you’ve read this one already, scroll down a bit or click 19 January 2018 to jump down the page. I arrived to the gate with my pens and sketchbook… waiting to be registered, checked off the list, given a visitor’s pass (to be worn at all times). Anticipating the day and a little bit nervous (I shouldn’t have read those articles the night before; someone died here, not too long ago). 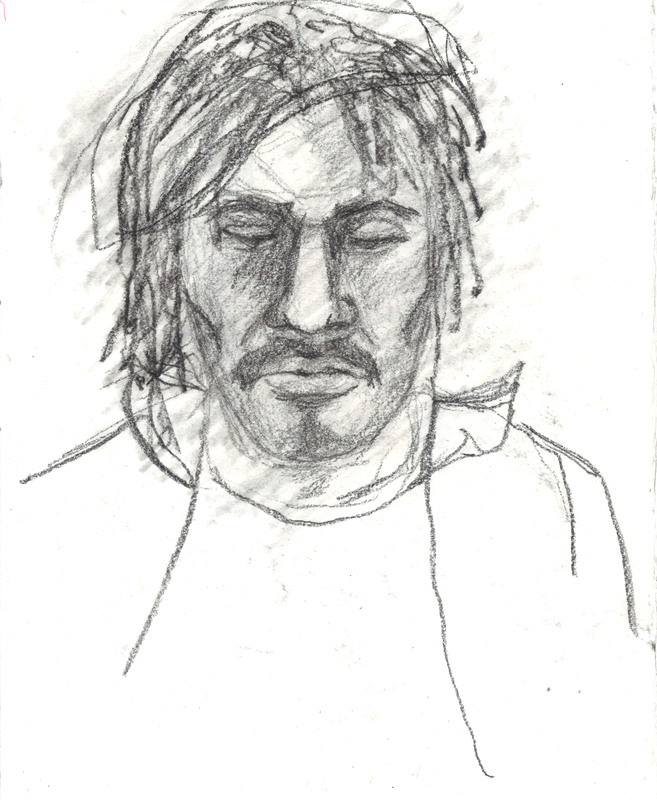 Kelise Franclemont, ‘Wayne’, study from London Shakespeare Workout, 15 December 2017, at HMP Pentonville, London. Kelise Franclemont, ‘Vlad’, study from London Shakespeare Workout, 15 December 2017, at HMP Pentonville, London. Kelise Franclemont, ‘Jacob’, study from London Shakespeare Workout, 15 December 2017, at HMP Pentonville, London. Four energies burst in all smiles and a handshake, Wayne shining confidence in a dancer’s step; Vlad his spirit gently glowing with firm purpose; Edwin, solemn, kind, a professor, a mentor, someone’s dad perhaps, in another life… Jacob with his whole soul in his eyes, not sad exactly, but something’s there, just behind the dignity and resolve. Model prison, Pentonville, from The Illustrated London News, 1843. Illustrator unknown. …self to character to self again. Kelise Franclemont, ‘Edwin’, study from London Shakespeare Workout, 15 December 2017, at HMP Pentonville, London. 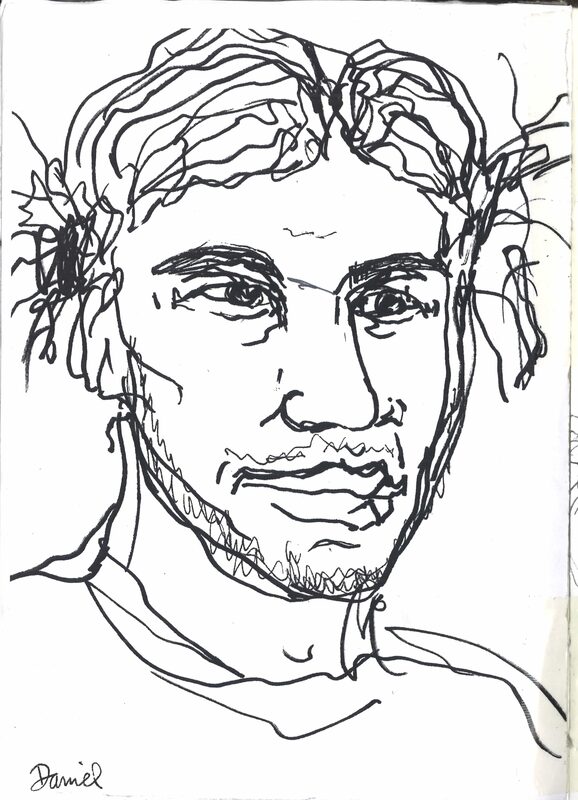 Kelise Franclemont, ‘Jude’, study from London Shakespeare Workout, 15 December 2017, at HMP Pentonville, London. Kelise Franclemont, ‘Peace is what we need!’, study from London Shakespeare Workout, 15 December 2017, at HMP Pentonville, London. Three more actors arrive, two whose names I can’t quite hear over the musicians testing the newest phrase, the first tall and well-met with the easy smile full of welcome, the second whose spirit, unlike the others, is a carefully guarded mask. Still I’m not convinced by the tough-guy-i-don’t-care exterior, who pretends to be here for a change of pace – I can feel the gusto with which he gathers his why-not in a fist to shout in chorus “I’m free!” …and Daniel, a spark about to ignite… and I saw it happen when he became an old man, palsied and stumbling, unable to speak…around him courage swelled and defied all weakness, to help him raise his hand, grasping an imaginary torch that we all could see. And he is a hero. Kelise Franclemont, ‘Daniel’, study from London Shakespeare Workout, 19 December 2017, at HMP Pentonville, London. I am surprised when the guys crowded around my table at the end, to check out my drawings, hoping to see themselves maybe… and I wish that I’d been able to capture more between my eyes, fugitive moments, and my pen, to portray each of the men before me: Wayne, Vlad, Edwin, Jacob, “all smiles”, the one I don’t know quite yet, and Daniel. Each of them proud, confident, strong… powerful and vulnerable and brave…warm, open, funny, creative… and beautiful. Daniel, shyly bold, asked me to draw him… not of vanity I felt, but of a desire to be viewed under a different light… I am humbled by his confidence in me, and I don’t know what to say, except that I’ll try. I’ll do my best. Kelise Franclemont, ‘Daniel’, study from London Shakespeare Workout, 15 December 2017, at HMP Pentonville, London. Kelise Franclemont, ‘Vlad rises up and leads the chorus – ‘Prepare!’ ‘, study from London Shakespeare Workout, 15 December 2017, at HMP Pentonville, London. My job here today was not to know such things anyway, but to look and to really see. Thanks to these seven inmates, actors, people for showing me the place you happen to be in now does not have to define you, your present, nor even your future. Who do you want to be, you can be; now that is the question. 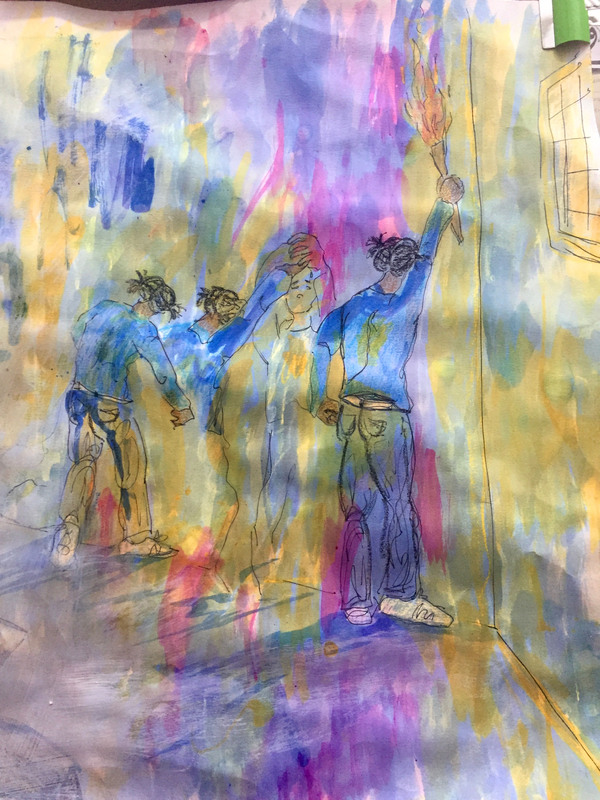 Kelise Franclemont, ‘Daniel as Mohammed Ali takes the torch’, study from London Shakespeare Workout, 15 December 2017, at HMP Pentonville, London. There are no musicians today to accompany the scenes; it’s just myself and Bruce from the outside on the return to Pentonville. I’ve also recovered somewhat from my nerves; though I’m still not 100% used to the idea of being in a place with no way out for any length of time, at least I know what to expect here: register, visitor’s pass (to worn at all times), narrow corridors and plenty of corners, no Christmas tree this time, and more locked unlocked locked again gates. Bruce and I both warm up, he with his script, I with my sketches, as we wait for the men to suddenly pour in all at once to C3, the same room as before. Like my last visit, I am greeted warmly by familiar and friendly faces, with a few new ones, and am glad I had, in the weeks previous, attempted to sketch outline portraits from memory; all the guys seemed pleased to have been remembered even imperfectly (although there was some comedic debate as to whether or not I had gone too far with the lace collars and “men in tights” costume ideas borrowed from the 16th century). Knowing the impossibility of describing anyone in hastily scribbled ink, always moving, pacing, gesticulating, I chose pencil instead to observe the actors sitting away from centre stage, still for moments at a time, heads bowed, awaiting cues, or mouthing their lines. 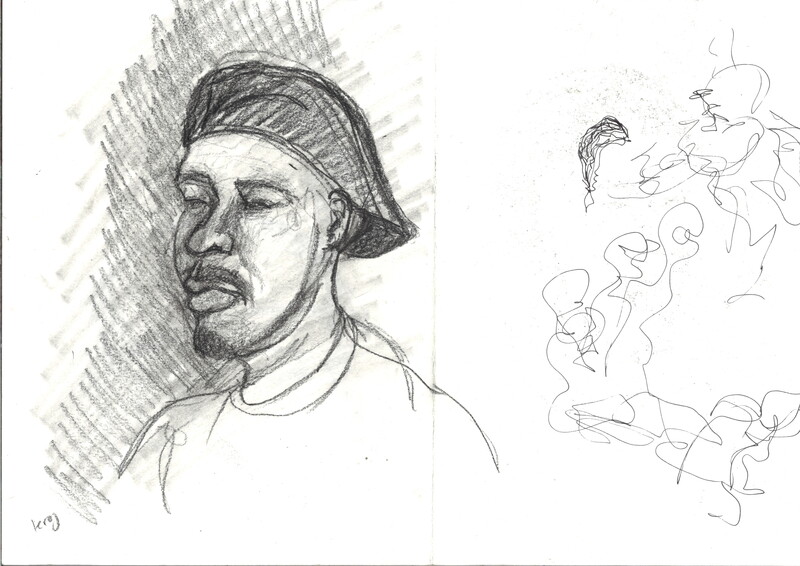 Kelise Franclemont, ‘Wayne and Jacob’ (l-r), study from London Shakespeare Workout, 19 January 2018, at HMP Pentonville, London. I couldn’t guess why the mood today was one of familiar ease (after all, most men had been an artist’s subject many times before), yet still detectable was a faint thrum of tension. Later, this undercurrent of nervous energy is explained when I am astonished to learn that the actors were due to perform their piece for an audience in a few days’ time – with only the equivalent of about a week of rehearsals over the same number of lines for which outside companies would possibly take months. Kelise Franclemont, ‘Leroy’, study from London Shakespeare Workout, 19 January 2018, at HMP Pentonville, London. Back in my sketchbook, Daniel is my momentary subject, yet I can not quite get his likeness; he seems so youthful, hardly containing an excess of energy as he recites his lines, yet on my paper is inscribed a soul that has weathered more years than would be admitted by his actual age. Abruptly, it’s a good thing that our time has just run out, as the portrait version of Daniel is rapidly approaching octogenarian. It’s as if my eyes and my pencil obdurately insist on seeing different things. Giving up for now, I pack up my supplies and it’s back through umpteen gates (locked unlocked locked again), more corners and corridors, the visitor’s pass is returned, and I am glad to join the city air and waning sunshine again. Posted in drawing and painting, residencies, site-specificTagged contemporary drawing, site-specific installation, storytelling in artBookmark the permalink.